Public Folder is launched with initial version of the Microsoft Exchange. Basically, it is mainly designed to offer a simple and effective way to collect, share, and organize business related information within an organization or in work groups. However, these folders follow an organized hierarchy and they may be replicated in between an Exchange servers mailbox. The most interesting aspect of such Public Folders is that they are saved in dedicated mailbox stores named as Public Folder Database. Moreover, all the data components are stored within Exchange EDB file format (.edb) in Public folders database. In the following section, we will discuss how to restore deleted Public Folder from .edb exchange in the easiest manner. As lots of crucial information is stored in Exchange server Mailbox. Therefore if such databases are subjected to any kind of disaster such as corruption or data deletion from the EDB file can put a large amount of data on such area. Sometimes, such file incorporates necessary information associated with business concern and organizational budgets. Due to such reasons, all organizations start using dedicated databases, which follow the fundamental rule of backing up. So, public folder backup may be the monotonous and too lengthy procedure that helps to recover lost mailbox from .edb Exchange server mailbox. To safeguard data saved within .edb files against various threats, that’s why it is advised that DBAs must follow a strict public folder backup schedule. Public folder Backup tasks may seem like a tedious, but its real worth in the instance of failure. Even no one can predict the date and time when the server becomes down or the Public Folders databases cannot accessible. Therefore,public folder backup is the only key to restore deleted public folder from .edb exchange in case of serious corruption and Exchange Server mailbox failure. 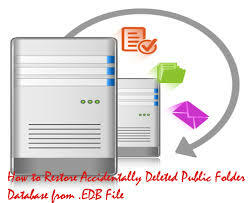 In addition, it is the best way to recover lost mailbox and restore deleted public database from .edb exchange files. How to Mount Exchange Server ? Through Windows Server public folder Backup restore Exchange mailbox to a distinct location from initially stored public folder backup database. Then, Launch the Exchange Management Console and choose the Microsoft Exchange. Next, select the Server Configuration and click on exchange server Mailbox. Now, You will search the Server list within the center. Choosing the Server on which to recover lost mailbox database resides to repair lost database . After that, select the exchange mailbox Database, which you need to restore deleted public database. Next, click Dis mount exchange server Database and choose the Properties where you have to dis-mount exchange server the database. You will get a check box, which shows This database can be overwritten by a restore, mark on it and press on Apply. Now, in the Windows Explorer navigate to the directory where you have restore deleted public folder the Exchange server mailbox database and then, find the public folder database. Remember: The usual path of the restore public folder database is :\Program Files\Microsoft\Exchange Server\Mailbox\\Now, Copy the retrieved Public Folder Database file Navigate to the public folder that you want to dis mount exchange server the database. Next, rename the original database and then, Paste the retrieved exchange mailbox Database file here. Keep in mind that the name of the database is same. Finally, choose the Re mount exchange server database option in the Exchange Management Console to restore deleted public database. Under the Exchange Management console Shell, choose the folder where your exchange mailbox database is located. In last, Retrieved public folder by running the command on cmd prompt: eseutil -p .edb”. After performing this steps, you can easily repair lost database from .edb exchange by using the Exchange Management Console. Recover lost mailbox database is considered as the primary task of Exchange administrators. In earlier versions of the application, repair lost database from .edb exchange file was a complex procedure, which includes lots of sub-task such as public folder backup, and Recover lost mailbox. In Exchange Server database, recover lost mailbox has become more easy and simple way to retrieved exchange mailbox database. So, we have discussed overall manual procedure to restore deleted Public Folder from .edb exchange file in detail.